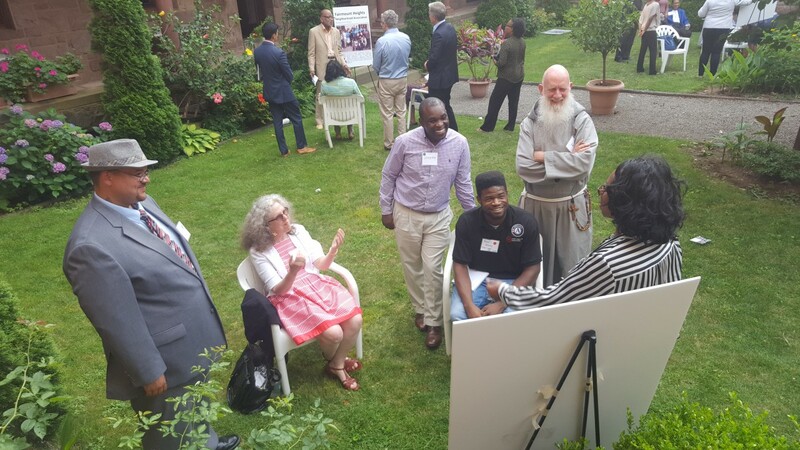 In June, several Victoria Foundation Trustees joined Greater Newark LISC and the Urban League of Essex County for a presentation from resident leaders, in Fairmount Heights, on the challenges and opportunities for community change. Fairmount Heights is one of the two communities selected to take part in Victoria Foundation's multi-year commitment for its Thriving Neighborhood Initiative (TNI). TNI is a resident-driven, targeted investment in two Newark neighborhoods - Fairmount Heights in the West Ward and Upper Clinton Hill in the South Ward. The work is in its early stages, beginning with engaging and activating residents in both neighborhoods with the goal of building their capacity to work alongside key stakeholders to lead community development initiatives addressing priorities related to quality of life, such as education, public safety, health, and housing. To date, the work has been more robust in Fairmount, given the momentum built by the Urban League with community residents. In Clinton Hill, a neighborhood association is being reinvigorated and a coalition of partners is being organized, given the absence of a traditional community development organization. Over the summer, leaders of the Fairmount Heights Neighborhood Association met with Victoria trustees and staff.The meeting was held at the Most Blessed Sacrament Friary, an architectural gem in the Fairmount Heights neighborhood with a beautifully landscaped court yard, that provided an inspiring backdrop for the residents' presentation. Residents leading work on public safety, education, land use, and community building led talks at stations on their efforts, the challenges they were experiencing, and the bright spots. Trustees rotated from station to station asking questions, and learning more about the residents leading the work and what is happening in the community. committee, talked about her definition of a safe community being a place where parents felt okay to let their children go outside and play. She referenced that some of the girls in her youth program did not know how to ride a bike because their parents feared what might happen if their bike was stolen or if they were riding in the wrong place at the wrong time. Dorian Johnson, the association's president, remarked how he had been a lifelong resident of Fairmount but did not get to know his new neighbors until he started going door-to-door with the association. Johnson said, "There are a lot of new people in the neighborhood since the time when I was growing up. I'd see them, and we'd wave and say hello, but I didn't know their names and their children until I started reaching out to get them involved in the neighborhood." "Victoria announces our new online grants management system. Not only are we moving to the cloud, but we are doing a communications overhaul! " resident engagement and capacity and begin aligning its work to a shared neighborhood improvement plan. Mary Modlin exemplifies the work best—before LISC she was just a lay member who attended community meetings with little happening month to month, she now leads the association's education committee and has spent the past year engaging with neighborhood schools and PTAs, organizing literacy, parenting and mentoring activities.